The death of someone we love is one of life’s most difficult challenges. 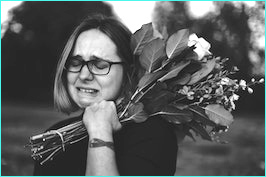 Showing our compassion for our friends and family who are grieving can be uncomfortable. Often, we do not know exactly what to say or do to support our loved ones during this complicated time. We may be afraid of overstepping our boundaries, saying the wrong thing, or making our grieving friend feel even worse. Here are a few simple examples of how we can comfort and support our friends and family as they grieve a loved one. Most people don’t realize that simply being present can be a tremendous form of support and relief for someone who is mourning. Don’t let your fear of saying the wrong thing stop you from reaching out; it’s more than likely that your loved one will appreciate a simple gesture or phone call. Etiquette expert Diane Gottsman explains, “We have to remember that the right thing is just showing up ― just putting your arms around your loved ones, just saying the words, ‘I’m so sorry.’” If you can’t be there in person, sending a handwritten sympathy card is a great way to let your loved one know that you are thinking about them. Try to resist the temptation to offer suggestions and advice. While your book recommendations and suggestions to start meditation may come from good intentions, your loved one may not be looking for advice on how to heal. These suggestions may make the grieving person feel even worse, as they may believe that they aren’t healing fast enough or in the “right” way. Unless someone insists, do not give advice. Instead, just be fully present. Many of us want to cheer up our loved ones and remind them of everything they have to be thankful for. But this can cause them to feel as though their sadness is being overlooked and deemed invalid. Instead of trying to get your friend or family member to look on the bright side, simply bear witness to their emotions and let them feel what they are feeling. Know that everyone’s grief process is completely unique, and they may only want to sit in silence or have a shoulder to cry on. While we should never try to force our loved ones to speak if they don’t want to, we can let them know that we’re here to listen if they would like to talk. For some, speaking about their loss may be too painful, but for others, telling stories about their relationship to the deceased may be healing. “Do you feel like talking?” can be a great way to let your loved one know that you’re willing to listen and bear witness to their grieving process. If your friend or family member chooses to talk, remember to listen compassionately and without judgment. Ask questions about how they feel and don’t try to compare your own grief to theirs or claim that you know how they are feeling. No two people grieve the same way. When you’re at a loss of how to respond, “I’m not sure what to say, but I want you to know I care” goes a long way. Long after the funeral ends and the flowers stop being delivered, chances are your loved one will still be grieving. Continue to check in periodically and let your loved one know that you care for them. Avoid encouraging them to “get on with their life” or “put this behind them.” Grief is a lifelong journey, and while the initial shocks and deep sense of pain may fade, the sadness may never go away. Holidays and other special occasions can be especially difficult, so be sensitive on these occasions. With your ongoing support, you can help your loved one honor the memory of the deceased while feeling cherished and loved. For bereavement helplines, support groups, and recommended readings, please visit www.helpguide.org/helping-someone-who-is-grieving for more information.